Alexa whisked into town over the weekend, reaffirming the fact that old friendships are golden. 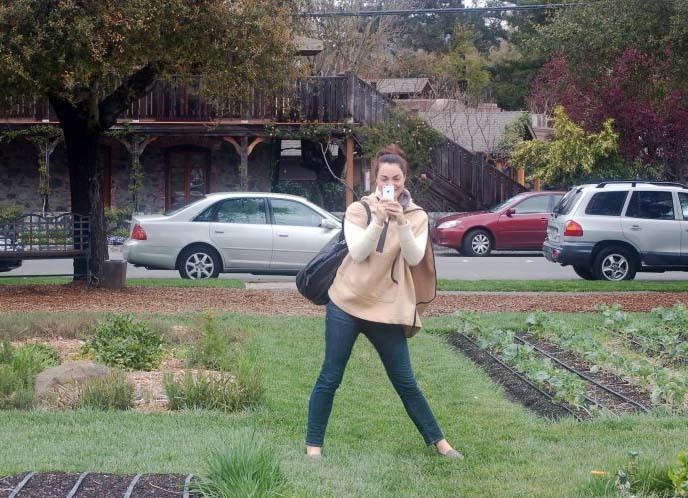 We spent most of our time up in Wine Country avoiding the spring rains by staying cozy indoors – eating incredible food (the best French fries and desserts here and delectable brunch here), sipping wine, snapping random photos and making each other laugh. Just before she left last night I came down with a mean case of the Sunday blues. On the drive back from the airport I decided not to give in and switched into blues fighting combat mode. First stop, the grocery store. Naturally. There’s nothing quite like surrounding myself with foodstuffs of all sorts to instantly lift my spirits. In an effort to save after our weekend splurge, I plunked a random assortment of items in my basket with the intention of bringing my lunch to work every day this week. Carrots and shallots for this dressing. Sweet potatoes for roasting. My favorite Greek yogurt to pair with my new favorite granola. Yes! A new favorite granola that’s made with maple syrup and olive oil. Maybe you’ve heard of it? The recipe has been all over food blog land lately. It’s so good that I’ve got to share it with you, even if it’s not entirely new. The timing just feels right. There was that snippet in The New York Times Magazine yesterday. 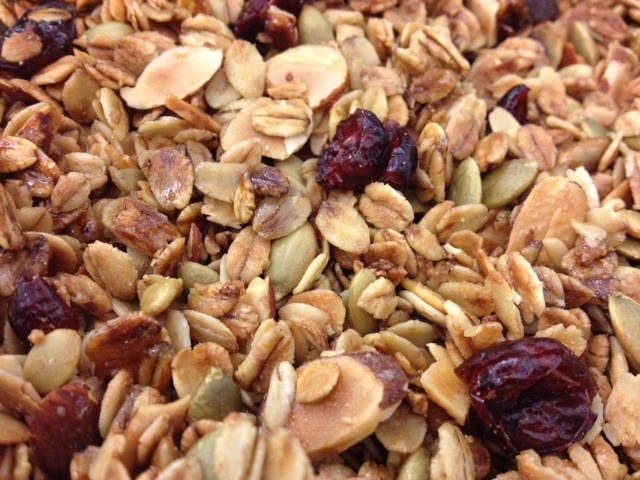 Did you know that granola was originally called “granula?” And it was only edible only when soaked in milk overnight? What progress we’ve made! Plus, Lex and I were just touting our mutual love of granola on our road trip up to Calistoga. So, once I returned from the airport last night, it seemed like the best thing to do was fire up the oven and make a big batch in her honor. 1.) The subtle sweetness of the maple syrup and the ripe green of the olive oil lend to this granola’s balanced flavor. Try it. You’ll see. It’s perfect. 2.) Baking this granola turns the oats a nutty, golden brown and makes your kitchen smell delicious. 3.) You’re in control! The original recipe calls for coconut chips, pecans, sunflower seeds and brown sugar in addition to the ingredients I list below. I wasn’t feeling so sweet or nutty, but I encourage you to try any or all combinations that sound good. Don’t like cranberries? Fine. Don’t use them. Prefer pistachios? Perfect. Swap ’em in. Feeling tropical? Add coconut flakes. You get the idea. Be sure to add a bit more olive oil and maple syrup as you increase the ingredient count. 4.) 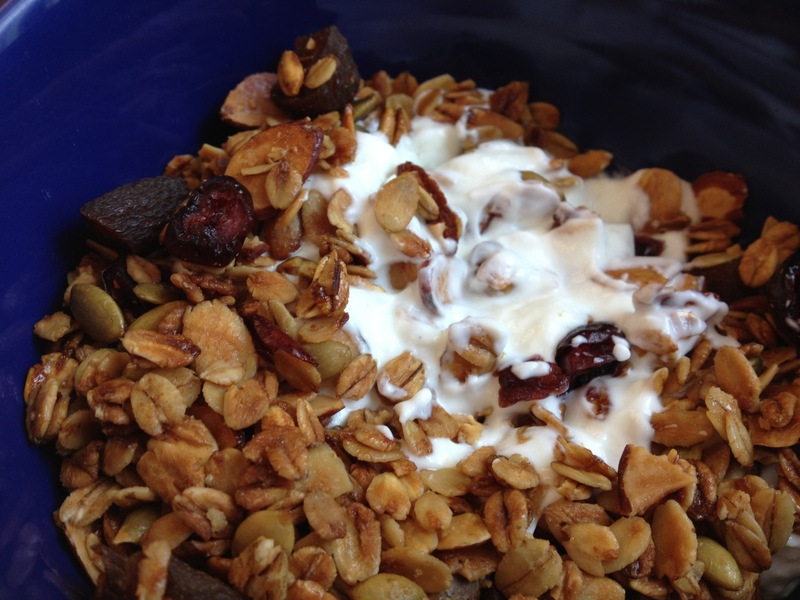 As mentioned above, I like my granola on the lighter side and not too sweet, with a little dried fruit. Nekisia Davis’ original recipe calls for more olive oil and maple syrup, but it tastes really good with less (and I completely omitted the ½ cup of brown sugar). 5.) If you add dried fruit, do not bake it! I’ve made this mistake too many times. It burns really easily and turns red cranberry jewels into black nubbins of char. 6.) Bonus! Making your own granola is vastly more cost-effective and likely better for you than buying it pre-made in the box or in bulk bins. In a large bowl, combine the oats, nuts, seeds (not the sesame), and salt. Stir to mix. Add the olive oil and maple syrup, and stir until well combined. Spread the mixture in an even layer on the prepared sheet pan. Bake, stirring every 15 minutes, until the granola is golden brown and toasted, about 45 minutes. Remove the granola from the oven. Stir in some dried fruit while the granola is still warm and cool completely on a wire rack. Sprinkle with toasted sesame seeds and mix again. Store in an airtight container. Eat with Greek yogurt and a dash of cinnamon.